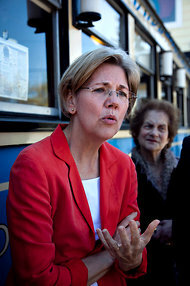 A blogger writes that Elizabeth Warren is experiencing her own "birther" moment. He explains what the controversy reveals about the conservative attitude towards race. By Kevin Noble MaillardDespite her personal belief in her origins, her opponents have seized this moment in an unnecessary fire drill that guarantees media attention and forestalls real debate. The Republican approach to race is to feign that it is irrelevant—until it becomes politically advantageous to bring it up. Birthers question Obama’s state of origin (and implicitly his multiracial heritage) in efforts to disqualify him from the presidency. They characterize him as “other.” For Warren, Massachusetts Republicans place doubts on her racial claims to portray her as an opportunistic academic seeking special treatment. In both birther camps, opponents look to ancestral origins as the smoking gun, and ride the ambiguity for the duration.And:Even within Indian Country, the meaning of race and citizenship is contested. And now the Brown campaign wants to dictate Warren’s own belief in her identity. According to the Brown campaign, Warren could not be Indian because she is blonde, rich and most of all, a Harvard law professor. Her 1/32 Cherokee ancestry, sufficient for tribal citizenship, is not enough for the Republican party. To most people, she appears as white as, well, Betty White, but to the Scott Brown campaign, she is just Dancing With Wolves.And:For the Cherokee Nation, Warren is “Indian enough”; she has the same blood quantum as Cherokee Nation Chief Bill John Baker. For non-Natives, this may be surprising. They expect to see “high cheekbones,” as Warren described her grandfather as having, or tan skin. They want to know of pow wows, dusty reservations, sweat lodges, peyote and cheap cigarettes. When outsiders look at these ostensibly white people as members of Native America, they don’t see minorities. As a result, Warren feels she must satisfy these new birthers and justify her existence.Comment: Non-Natives also want to see leathers and feathers, teepees, horses, alcohol, and casinos, of course. So conservatives hate whites who pretend to be minorities. They hate minorities (Barack and Michelle Obama, Trayvon Martin, Sonia Sotomayor, Shirley Sherrod, et al.) for not being submissive enough. Basically, if you're not white and proud of it--ready to support the white establishment--conservatives hate you. For more on the subject, see NAJA Criticizes "Disrespectful" Warren Puns and Warren Column Uses Native Stereotypes.